God Bless the Bid Family. 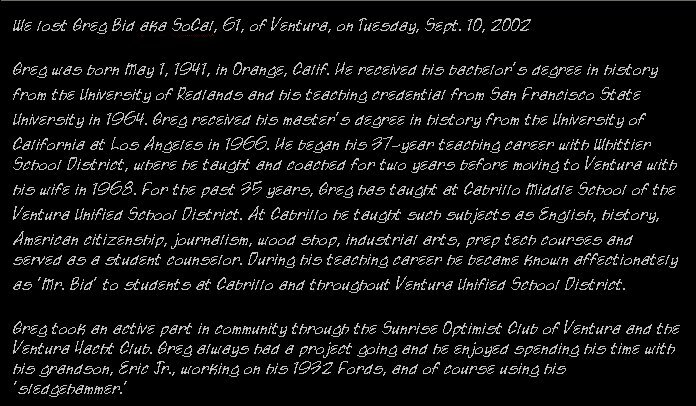 A special scholarship fund has been set up in SoCal's name. No donation is too small. The money will go for 1 or more students attending the Junior College for their books and tuition. The funds will be going to not the smartest, not the neediest nor the most improved as they have able money available to them if they apply for it. But for the student who has messed up and needs that second chance at life. SoCal's Scholarship is taking the Raiders philosophy of giving older players that second chance to go to the big game and putting into students getting that second chance at an education. It will probably go to the student who has messed up in life and now wants to walk the straight road. 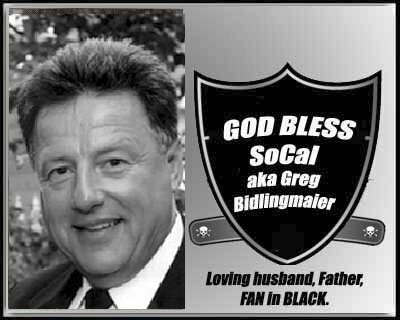 Please make your donations to Bidlingmaier, PO Box 2055, Ventura, Ca. 93002.